This weekend was such a busy one that I needed an extra day to recover. We had family in town to celebrate Kasper’s birthday. Kasper was a lucky little dude he got cupcakes on his birthday and a nice big cake for his party. Both were chocolate since he is my little chocolate fiend. I am a firm believer that on your birthday you should be able to eat your favorite things. Since he is a two year old with a limited vocabulary I made things that I know he likes. Each of my kiddos birthday parties start with a theme for inspiration. My girls love this part of party planning. Since Kasper is clueless about party planning I let the girls help. The inspiration theme was Gnomes & The Woods. Hobby Lobby had the cutest gnome stamp and brown card/envelope set. 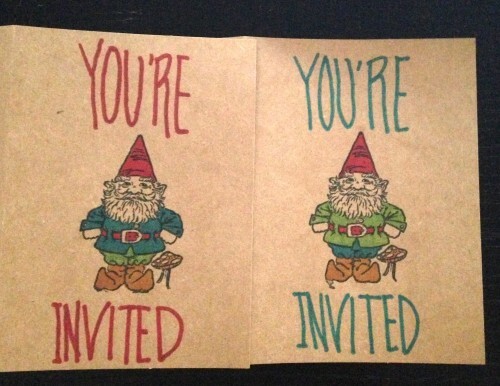 I got busy stamping the invites which I colored in with Sharpies –I need to work on my fancy handwriting. 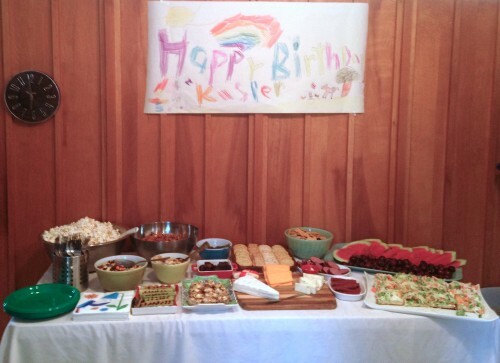 My daughters wanted to make a banner that hung over the buffet table. Of course they kept with the party theme too. There is a gnome and little woodland creatures on the banner. 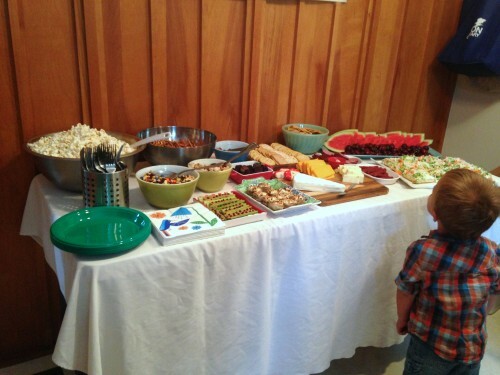 The birthday party was mid-afternoon so I opted for a snack/appetizer buffet. There are several recipes from the party that I will share in separate posts, so stay tuned! Sorry for the camera phone pictures! I snapped these quickly as guests were arriving. I always feel bad for trying to take photos of food when I have guests over. For his birthday cake I baked a chocolate cake using the Hershey’s Perfectly Chocolate Cake that I’ve made before. If you haven’t tried it you should give it a shot the next time you need chocolate cake. I guarantee it will satisfy your chocolate craving. Remember I am not an artist so my gnome looks a little wonky. These cupcakes I served on his actual birthday. I didn’t want to have a ton of cupcakes leftover since we were eating cake the next day so I was on the hunt for a small batch recipe. My hunt ended when I saw these Ferrero Rocher cupcakes that yielded only 12 on Just Putzing. I skipped the Ferrero Rochers and did a peanut butter cream cheese frosting instead. Chocolate + Peanut Butter is a match made in heaven. 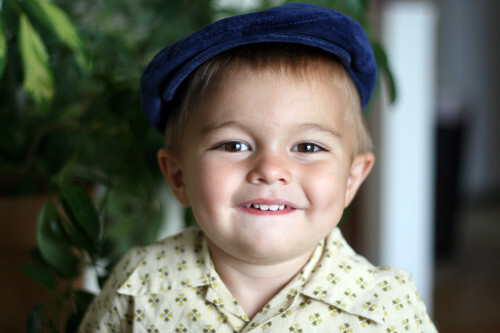 My birthday boy was a happy little dude too. Preheat oven to 350 degrees F. Line a 12 cup muffin tin with cupcake liners. Mix in vanilla and sour cream. What a sweet party for the most darling little boy!! The cupcakes look divine!! What a cool party. That pic of Kasper checking out the goodies is too awesome!! What a fun birthday party & theme. The cupcakes look delicious. Love those cupcakes! Such precious pictures of that cutie pie!!! Awww what a great and fun birthday!! 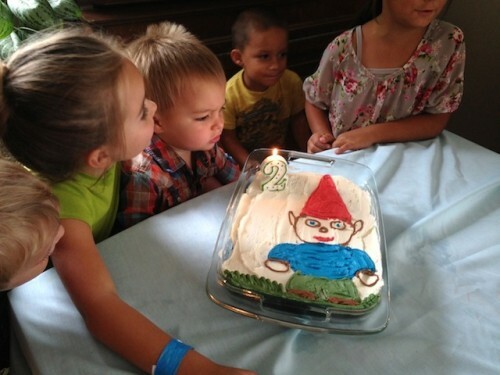 I love themed birthday parties and you did a great job with the gnomes. 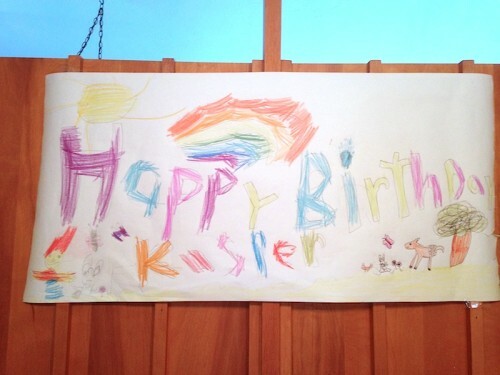 The cake is adorable and I’m sure Kasper loved it! The cupcakes look particularly tempting. What an adorable idea for a birthday party! I kinda have a thing for gnomes (random, I know :)) so I’m definitely keeping this in mind for my future littles’ birthdays. 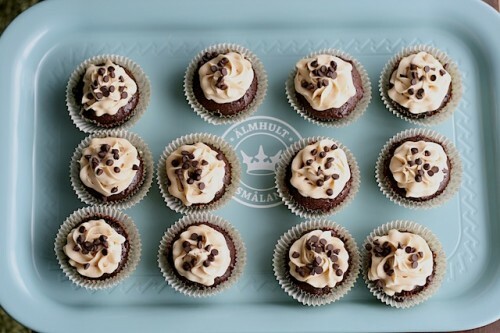 As for those cupcakes… YUM. I need those in my life, like, yesterday! p.s. LOVE those penguin creations in your header!!! Wow! ​looks delicious. 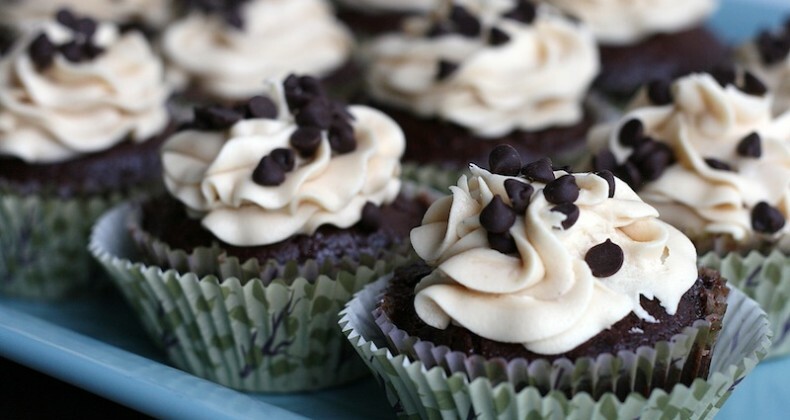 I would try making these chocolate cupcakes with peanut butter frosting​ for sure cuz i’m obsessed with desserts. Thx for sharing Jamie!